Aren’t Cherry Blossom Trees one of the prettiest trees around? 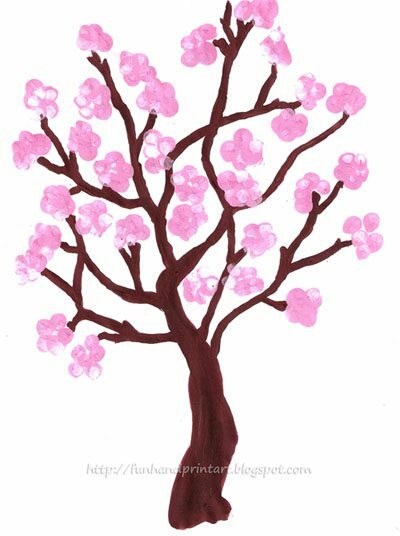 Kids can make their own fingerprint cherry blossom tree that also doubles a a fun counting activity. It’s perfect for a Spring preschool theme. Start by painting or coloring a tree trunk. Place a small blog of pink paint in a paint palette or on a plate. I helped my preschooler make a tree with 5-petaled blossoms using his fingerprints. He liked counting to 5 over and over again! You could instead do single fingerprints for an easier version and even a simpler tree truck. *These are affiliate links. Please read our full disclosure for more about these. Fall Fingerprint Tree that incorporates cutting and pasting. Snowy Winter Tree made with puffy paint. Printable Tree Template and Game Idea for counting your way through the seasons. I have never heard of it. I will have to check that out! I always like to see/hear when someone uses one of my projects. I made one of your trees with my 8 month old today, and we had a blast! Thanks for the great idea!